It has taken you forever to fill this role. The work has been building up – the last person doing the job left weeks ago. You have tried to share out the work as best you can to the rest of the team. But that is not ideal. But now you can relax. Your heroic new hire is going to save the day. What a relief. She’s here. Train her up. The work will be done. I hate to burst your bubble. But, just a little word of warning before you go racing ahead. 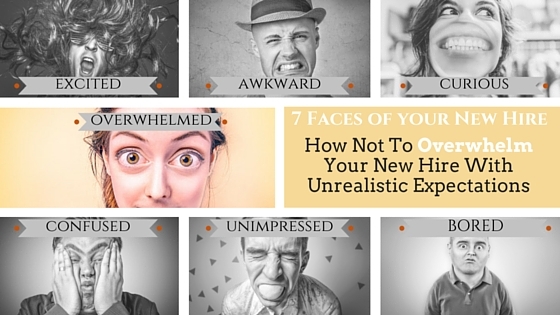 Be realistic about the expectations you have for your new hire. Don’t overwhelm her. Ignore this at your peril or you will be in danger of losing her before she has had a chance to succeed. The reason that you need her to get up to speed in a nano-second is your problem, not hers. Drop that problem onto her shoulders too early may result in her passing it back as she walks out of the door. But if you do this right, she will own this problem and resolve it. You have two routes to take. You could push her really hard. Give her all the information she needs and let her jump in. That is certainly an option, and a well-used one at that. And your new hire will probably get to a good level of competence eventually. But it will be a miserable way to get there. You will force feed her with so much information that she won’t be able to digest. It feels overwhelming. The pressure to succeed fast is extreme. She will make mistakes and lose confidence. She will not be demonstrating the level of competence that she wanted to in her new role. Then that evil self-fulfilling prophecy kicks in. She thinks she is a failure so she starts acting like a failure. And it is hard to crawl back up from there. This is especially true when you are not surrounded by people that know you well. People you can trust and will lift you back up. Instead, your focus should be on how you make her successful. Forget for now that you have a backlog that gives you palpitations. Think about everything she needs to take on and how you can make her shine at all of those. This means your expectations should be set by what she needs to achieve rather than by an arbitrary date you want it all sorted by. By taking a more steady approach will increase her confidence. And things feel so much easier when you are feeling confident. Make it clear to her that you expect her to have questions and concerns. That you know this is a big task you are asking her to take on. Let her know that you will find a way to make her successful together. That she is not tackling this challenge on her own. Take a lesson from the Hare and the Tortoise. If you push on like the hare, your new hire is likely to lose motivation before she gets to the finishing line. Take the slower route – be thorough – take it more gently and she will not only succeed but also have the energy to carry on. When you focus on making your new hire successful, it may feel like slower progress than the fast track route at the beginning. But it will develop her confidence and the trust in her support team around her, resulting in her overtaking it towards the end. Plan out how you will hand over the work to your new hire. You may want to stagger transferring the components so your new hire can become more comfortable before taking on more. This could be done over a period of days or weeks depending on the complexity of the work. If the current owner is leaving, make sure there is another co-worker sitting in when the knowledge dump for the critical parts of her job takes place. He will pick it up faster as he has more inside information. Your new hire then has a go-to person for questions once the other person has left. It is a lot less overwhelming knowing you are not the ONLY person that holds this information. Set a realistic plan and execute within that timeframe. Factor in some easy wins. Success instantly boosts confidence and motivation. She will feel good about moving forwards. Schedule regular check in points with your new hire. Encourage them to note down all their questions or concerns. Remember to tell her this is an expected part of her journey. There are times when this is the case. I know – I’ve been there. In these situations, make sure she is surrounded by support. It is imperative that she knows that you asking a lot of her. And make sure the team around her knows that too. Tell her you can’t expect perfection but you will do everything you can to help her succeed. Set regular review sessions in stone to keep checking in. She needs to know you have her back. If you are constantly having to ‘fast track’, it may be time to rethink your hiring strategy to get the best from your new hires. When you have been waiting so long for a new hire to join, it can lead to a sense of desperation. This work has been building up and you need it sorted fast. There is a huge temptation to hand it over and hope for the best.